Filed on January 7 2013 with the expert legal counsel support of Finnegan, Henderson, Farabow, Garrett & Dunner, LLP of Palo Alto, CA, WujiTech is awarded a key Patent by the U.S. Patent and Trademark Office (USPTO). The title of the Patent is: METHODS AND SYSTEMS FOR DETERMINING, MONITORING, AND ANALYZING PERSONALIZED RESPONSE VARIABLES USING BRAIN WAVE FREQUENCY DATA AND INTERACTIVE MULTIMEDIA DISPLAY. Palo Alto, CA – June 5, 2013 – WujiTech, Inc., a leading provider of a secure cloud-based collaborative software dashboard and the WujiBrainWave App for iPad, PC and the Mac on iTunes, celebrates a talented teen for his creative application of the WujiTech software tools. WujiTech Introduces MindMedia to Promote "Joy"
The new "Joy Monitor" MindMedia allows a viewer who wears a wireless brainwave monitor (part of the WujiBrainwave solution) to "see" how they respond to stimuli and triggers that affect how they respond emotionally. Natural language feedback is provided at the end of the 2 1/2 minute MindMedia and this provides positive suggestions and techniques to improve areas that need improvement - and also gives encouragement when the viewer reached their goals and objectives. The WujiBrainwave app tracks sequential sessions and supports improvement over time. Arlington High School Class of 2015 student Joseph Romano created quite a buzz at the annual Science Symposium by focusing on brainwave research in the area of emotions. He chose the WujiBrainwave app as the core of his demonstration which focused on three scientific studies and their data sets and presented connections between the data and his empirical conclusions. His goal was to determine if the WujiBrainwave app, using the NeuroSky MindWave headset, was truly accurate at determining emotions. His conclusion was that the software/hardware combination was indeed accurate. Joseph’s presentation included possible applications for the WujiBrainwave app including therapeutic, medical, and educational uses. Palo Alto, CA – January 6, 2013 – WujiTech, Inc., a leading provider of a secure cloud-based collaborative software dashboard, today announced the availability of the newly-released WujiBrainWave App for iPhone, iPad, PC and the Mac on iTunes. The exclusive app combines a local and cloud interface, displaying both video and real-time 3D animation. WujiTech was featured as a core application developer at the 2013 Consumer Electronics Show (CES) in Las Vegas for NeuroSky, the manufacturer of the breakthrough MindWave brainwave monitoring headset. WujiTech demonstrated it’s newest WujiBrainwave app v1.2 for Apple OSX, iPad iOS, and Windows operating systems and was positioned in CES's "Digital Health" area, reinforcing its focus as a solution for health and well-being. CES had over 150,000 attendees from all over the world and through three days of non-stop product demonstrations, WujiTech established new markets in Asia and continued to show its place as a leader in 3D animated brainwave game development. Palo Alto, CA – October 1, 2012 – WujiTech, Inc., a leading provider of a secure cloud-based collaborative software dashboard, today announced the availability of the newly-released WujiBrainWave App for iPhone, iPad, PC and the Mac on iTunes. The exclusive app combines a local and cloud interface, displaying both video and real-time 3D animation. WujiTech has partnered with NeuroSky, a bio sensor company and leader in Brain-Computer Interface technologies for consumer product applications, to provide a state-of-the-art brainwave headset. The user can participate in ‘MindMedia’ apps, which include customizable games and videos to provide feedback on brainwave patterns for both participants in both the educational and health and wellness markets. WujiTech’s patented algorithms allows for one to monitor levels of joy, attention, and inner calm. 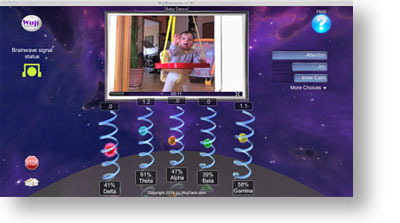 WujiTech’s WujiBrainWave is the first of its kind to provide a fun tool that provides real-time feedback of physical brain behavior. There are a variety of applications for children, adults, educators, and health and wellness professionals, such as cognitive development, stress management, personal growth and skill training. Additionally, the WujiBrainWave app serves as an extension of and fully integrates with the WujiDashboard providing data gathering for research analysis and comparative analysis. WujiTech is a technology leader in education incorporating MindMedia learning tools, brainwave interaction, and a software dashboard that allows the ability to connect, collaborate, assess, track, and act by encouraging user interaction across communities in the education and health and wellness markets. Palo Alto, CA –June 6, 2012 – WujiTech, Inc., a leading provider of a secure cloud-based collaborative software platform today announced the launch of the Wuji Dashboard and WujiBrainWave application. WujiTech’s powerful core software application – the Wuji DashboardTM - is a highly customizable SaaS platform that includes data gathering and personal analytics, social/business networking, courseware delivery, e-commerce engine, communication tools, event scheduling, and content management in a single integrated and secure environment. WujiTech is currently being used by a variety of educational environments and can be tailored for a wide range of markets including educational learning, health and wellness, research and development, coaching and mentoring, enterprise collaboration, brand engagement and market research. The WujiBrainWave app is fully integrated with and an extension of, the Wuji Dashboard. It delivers insights into how the brain works over time, and serves as a tool for education and personal/professional development. WujiTech’s solutions transform how people interact and perform, redefine how people conduct research, track individual progress and evaluate online feedback in real-time – all personalized for the individual user. In addition, administrators can gather and analyze data, generate graphical reports, and share information with individuals to guide strategic future planning.